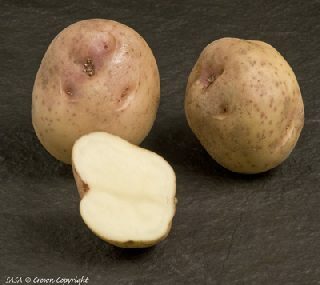 Kerr's Pink is a popular commercially grown variety of potato in Ireland although not so popular anywhere in the UK or Ireland with amateur growers. If you grow this variety you might expect pink skinned potatoes but you will be disappointed. Yes there is a pink tinge to part of the surface with pinker eyes but overall this looks much like your average spud with an irregular shape. It keeps very well and is good for cooking as a boiler, mash and chips. The parents of Kerr's Pink are Fortyfold x Smith's Early. This is a potato with a bit of character, the shape is generally round but it's quite irregular. The skin is mainly light brown with the areas surrounding the eyes a definite pink colour. Because of its low water content it keeps for several months. This is not a potato variety for those living in windy conditions because the plants grow very tall. It was first introduced in Scotland in 1907 by J. Henry and only ten years later in 1917 did it appear in in Ireland. A Mr Kerr (the variety was initially called Henry's Seedling) grew it commercially and only now is it beginning to lose favour compared to other varieties. Kerr's pinks is excellent for roasting, wedges and boiling. It's slightly irregular shape and deep eyes can be considered a positive or negative - for us it gives this potato character. They are floury, starchy and have low water content which makes them one of the best keepers of all. Kerr's Pink are not available in many garden centres or discount shops but they are available from several online suppliers. The key qualities of this variety are flavour and keeping qualities. On that basis Desiree would make a good alternative. The keeping qualities match those of a Kerr's Pink and at the same time it produces a decent sized potato. In all the tests we have conducted and those we have researched, there is no detectable difference between maincrop potatoes which are chitted and those which are planted directly in the ground. However if you want to stick with tradition and chit your Kerrs Pink potatoes, we recommend that you start chitting / sprouting this variety in the third week of February. This will give them four to five weeks to develop healthy sprouts just at the time when they are ready to be planted out. Keep the potatoes in cool but light conditions to ensure they grow short, green sprouts. Click here for our page dedicated to chitting / sprouting potatoes in the UK and Ireland. Kerr's Pink potatoes are maincrop potatoes and they are ready for harvest, if conditions are correct, 18 to 20 weeks after the seed potatoes are planted. The key factor governing the time for planting all potatoes is the date of the last frost in your area. Even a touch of frost can damage potato plants if their foliage is above ground, an unexpected severe frost can kill them completely. The date for planting Kerr's Pink potato seed can be calculated on the basis that seed potatoes will take four weeks before they appear above ground. Given also that you want them to appear above ground only when the danger of frost has passed (the last week of April is the UK average) the last week of March is about right time to plant them. The harvest date for all potatoes is not only dependent on when you plant your seed potatoes, it also depends on the weather conditions throughout the growing season. But on average you can expect your potatoes to be ready for harvest some time between the first and third weeks of August in your area of the UK. The table below sets out how good or bad Kerr's Pink potato plants are at resisting common pests and diseases in the UK. The 0 point is average with minus (red) values showing lower than average resistance and plus values (green) showing higher than average resistance. USE: Good for boiling and mash, it also produces good chips.